People genetically prone to arthritis who also smoke are storing up trouble for the future, researchers warn. It is already known that smokers are at increased risk of arthritis and that arthritis can run in families. Now a Swedish team from the Karolinska Institute have shown that combining both risk factors increases a person's risk of disease more than 15-fold. 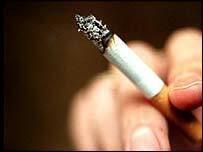 Experts said the findings, in Arthritis & Rheumatism, emphasised the importance of quitting smoking for health. The researchers studied 858 people with rheumatoid arthritis and 1,048 healthy people for comparison. All of the participants, who were either current smokers or had never smoked, were asked to donate some blood for testing. This allowed the researchers to sort the participants into those with high levels of an antibody called rheumatoid factor (RF positive) and those without (RF negative). RF is found in the blood of many people with rheumatoid arthritis and is believed to play a role in tissue destruction associated with this disease. But people who never develop rheumatoid arthritis can be RF positive. Equally, people can have rheumatoid arthritis without high levels of RF. The researchers also looked for inherited genes that are known to increase the risk of rheumatoid arthritis. Those who had never smoked with these genes were 2.8 times more likely to develop arthritis than normal. Similarly, current smokers with none of these genes were 2.4 times more likely to develop arthritis. This showed that both factors - smoking and genes - independently increased the risk of arthritis. When the two factors were added together, the risk escalated. Smokers who had inherited one copy of the 'risky' gene pair were 7.5 times more likely to get arthritis. The risk was 15.7 times higher in smokers who had inherited both copies of the gene. But this was only the case in the people who were RF positive, which the researchers said they could not explain. Neither smoking, inherited 'risky' genes nor a combination of the two increased arthritis risk in the RF negative people. Beyond strengthening the case against smoking as a health hazard, the researchers said their findings had important implications for research. "Our study also emphasises the need to include data on environmental exposures in genetic analyses of complex diseases," they said. A spokeswoman from the Arthritis Research Campaign said: "It's been known for some time that smoking is a risk factor for rheumatoid arthritis. "There are various other risk factors and having a genetic predisposition is one of them. "If you have a genetic predisposition and you smoke then your risk goes up even more. "The message is don't smoke."